Google has always taking security for users seriously with their two-step verification and it seems Apple is finally adopting the same process for Apple ID and iCloud users. The new system works just as it does with Google and others, you first have to enable on the Apple ID website, then you use your device to receive verification codes as needed via text or the find my iPhone app to enable you to sign into various Apple services. There is also the option to hide a key away incase you unfortunate enough to lock yourself out of your phone or even worse loose it. This new feature seems to be US based at the minute but users are reporting loads of problems already. 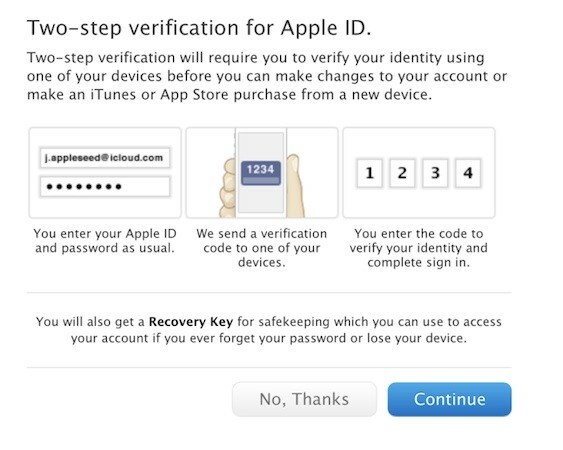 Time-outs and reports of verifications not sticking withing the Apple ID account after registering a device seem to be common complaints. We suggest you wait until Apple sorts these problems out before testing out and when it arrives in UK and other countries we will be sure to let you know.